As the economy continues to improve, many construction companies are shifting from survival mode into growth mode. That’s good news, but it’s critical for contractors to take a cautious approach to growth. According to Thomas C. Schleifer, a professor at Arizona State University’s Del E. Webb School of Construction, the failure rate for construction companies during an economic recovery is triple the failure rate during an economic downturn. Why? Because growth, while healthy, also puts a strain on your cash flow. Stick to what (and whom) you know. Few things increase your risk more than uncertainty. As work becomes more plentiful, it may be tempting to take every project you can handle. But it’s best to stay within your comfort zone. By sticking with your areas of expertise — and working with customers with whom you have a successful track record — you’ll have a good idea of what to expect and will be better able to predict your working capital needs and manage your cash flow. If you do step out of your comfort zone, consider asking for a deposit or accelerated payment terms to help cover the risks associated with unanticipated demands on your resources. Know your customers. Evaluate the financial strength and creditworthiness of potential customers, as well as their reputations for paying on a timely basis. If you have doubts about your ability to collect, think twice before committing your time and resources to their projects. Coordinate with vendors and suppliers. Try to spread out payables by arranging staggered payment dates. Don’t make payments earlier than required unless you’re entitled to a discount for doing so. Establish policies and procedures. Make sure your project management team submits paperwork and issues invoices on a timely basis. Develop a policy to create strong working relationships with your customers’ accounts payable personnel. Follow up with them to be sure payments are on schedule rather than waiting until a payment is past due. Create clear procedures for identifying changes in the scope of work and promptly preparing and documenting change orders in accordance with contract terms. Take your company’s pulse. Monitor work-in-process reports, cash flow reports and other documents to spot cash flow issues while there’s still time to address them. Pay close attention to underbilling and overbilling. Underbilling may reflect inefficient billing and management practices that can cause cash-flow problems. Overbilling can enhance your cash flow, but it may also signal underlying problems, such as unrecorded construction costs or unapproved change orders. Keep an eye on financial ratios and key performance indicators to spot dangerous trends that may affect your cash flow. For example, the current ratio (current assets / current liabilities) measures your ability to satisfy short-term liabilities with cash and other relatively liquid assets. Another useful benchmark is working capital turnover (revenue / working capital), which tells you the amount of revenue supported by each dollar of net working capital. A higher ratio may signal a need for additional working capital to support future growth. Have a system. It’s critical to implement a cash management system. Prepare budgets and cash-flow forecasts and make necessary adjustments during the course of a job. Create a plan for dealing with periods of tight cash flow. Review your contracts. Whenever possible, negotiate contract terms that promote healthy cash flow. For example, ask for a lower retainage percentage or for retainage to be phased out over the course of a job. And negotiate a front-loaded billing schedule so that payments are better aligned with your planned expenditures. These are just a few of the many strategies available for maintaining healthy cash flow. By taking a proactive approach to cash-flow management, you can improve your construction company’s chances of staying in business — and even growing your business — during the recovery. We welcome the opportunity to help you take a proactive approach to cash-flow management, which can improve your construction company's chances of staying in business - and even growing your business - during the recovery. Click the button below for a complimentary consultation. What can be done to improve the form and substance of your financial statements to improve your relationship with your bank and surety? 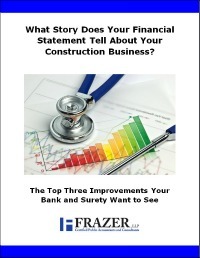 Download our complimentary ebook, What Story Does Your Financial Statement Tell About Your Construction Company: The Top Three Imrovements Your Bank and Surety Want to See, and find out. Getting your financial statements in shape. Making sure your financial statement tells the whole story about your company. Giving your bank and surety what they want to see. Download your complimentary copy today by clicking the button below.